One thing I know. It’s easy for income to crash and burn. It’s not so easy to reduce outgo, that is, spending. People become accustomed to a standard of living. It’s painful to take an ax to that standard of living after a loss of income. People cling to the familiar. Spending seems frozen solid. It thaws slowly. If you live in a house, mortgage payments won’t go down, at least not easily. Selling the house could take months, or years. If you live in an apartment, you might at least have to wait for the lease to expire before you can move. And then, move where? The kind of clothes you’re accustomed to wearing, the food you’re accustomed to eating, the entertainment you enjoy, whether lavish or simple. The car you drive! And the cost of gas. All the familiar things constitute your lifestyle. They cost money. Lifestyle is change-resistant; cutting spending is slow and painful. It’s the way of the American capitalist-consumerist economy. A few days ago, I promised to outline the steps that brought me to the present, which includes being able to restart this blog. I don’t want it to be all about money. Money is not important; that’s been my philosophy. Nonetheless, income and spending dictate the details of the way we live. When I turned 65 in the summer of 2013, and became eligible for Medicare, I imagined I could afford to retire. You know, stop working. So when the motel closed at the end of the season, I told the owner I wouldn’t be back for the 2014 season. Even now, I can’t say if that was the right or wrong decision. No point in looking back. I moved to my home county, because that’s where I grew up and where most of my relatives still lived. It seemed the logical thing to do. But the Washington, D.C., metro area is high cost-of-living. It became apparent that I couldn’t afford to rent an apartment congruent with my accustomed lifestyle. (And I was accustomed to living in quite small, one-room efficiency apartments.) Since rent is the largest item in my budget, rent became the central issue. So I decided to stop working (retire) in 2013. Retiring and moving in the same year are probably not a good plan, but that’s what I did. The reality of the income/spending lifestyle predicament soon became obvious. I should have been more aware that retirement would reduce income and require adjustments. Before long, in early 2014, I began pondering and researching the above question. Researching consumed most of 2014, 2015 and 2016. In a day or three, I’ll pick up the story. 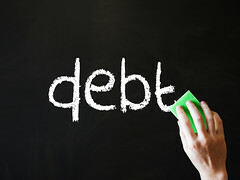 What If Debt Is Not The Problem?